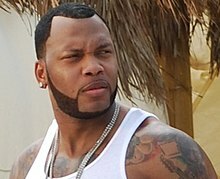 Flo Rida on the set of the music video for " Sugar"
Flo Rida began recording his second album, R.O.O.T.S., 9 months after Mail On Sunday. The album was released on March 31, 2009. The first single, "Right Round" featuring Kesha, was released for airplay in January 2009. "Right Round" jumped from number 58 to the top spot in one week in late February. The song broke a record for the most digital one week sales in the US, with 636,000, beating the previous record he had set himself with "Low". "Right Round" sampled "You Spin Me Round (Like a Record)", a 1985 hit by Dead or Alive. The second official single was "Sugar", which featured R&B singer Wynter Gordon. The song reached No. 5 on the Billboard Hot 100. "Jump", featuring singer Nelly Furtado, was the third official single and was released on July 27, 2009 in the UK, and July 28, 2009 worldwide. "Be on You", featuring singer Ne-Yo, was the album's fourth official single, released on October 6, 2009. Both songs charted in the top 100 in various countries. "Available", featuring Akon, was going to be released on iTunes but was cancelled. A music video was, however, shot in mid-2009. R.O.O.T.S. debuted at number eight on the Billboard 200 chart, selling 55,000 copies in its first week. As of August, 2009, the album has sold 223,000 copies in the United States, and 536,000 worldwide. By the end of 2009, the album sold 247,000 copies in the US, becoming the eighth best selling rap album of 2009. 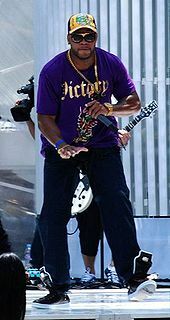 This page is based on the Wikipedia article Flo Rida; it is used under the Creative Commons Attribution-ShareAlike 3.0 Unported License (CC-BY-SA). You may redistribute it, verbatim or modified, providing that you comply with the terms of the CC-BY-SA.